If we're including the duster as an optional item, the oval belt buckle should be an option as well. I respectfully disagree due to two reasons. Firstly, we never see the lower bodies of the men with the oval belt buckles in the movie. I have also not been able to spot their lower bodies in behind the scenes material. Due to that, we do not know what kind of boots or pants they wear in the movie. 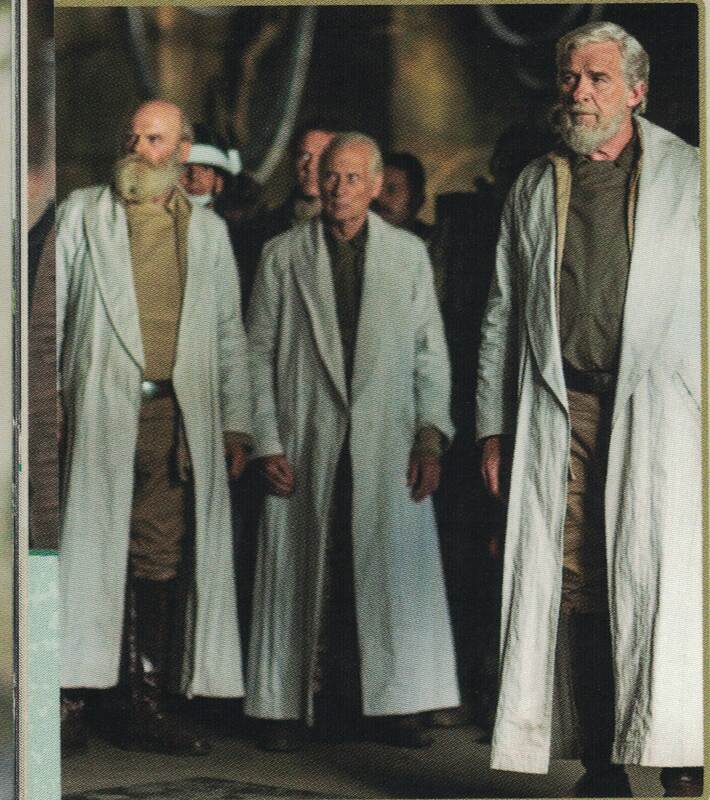 Secondly, there is a photo of General Jan Dodonna and General Baccam Grafis in the Rogue One visual guide. You can clearly see that they wear the oval belt buckle, but they do not wear the low boots with anklet cuffs. They wear brown riding boots. If they wear riding boots, they cannot wear the cargo pants because they would not fit into the boots. I am of the opinion that all characters with the oval belt buckles wear the same outfit as General Dodonna and General Baccam. So they would not fit into this CS as it is right now. 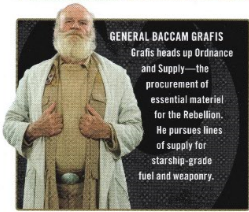 I am also pretty sure that Dodonna and Baccam as well as the other Generals with the oval belt buckles, wear the same outfit as the Rogue One version of Captain Antilles minus the RFT helmet but plus the white duster. It is more or less the same outfit that Dodonna and the other Generals wear in ANH. The minor color differences between the R1 version and ANH version of General Dodonna and the other Generals do not really justify adding their costume to this CS. Especially if we do not have enough visual references from the movie Rogue One. That's some good reasoning and evidence for there to be two different Rogue One High Command costume standards: one for the kneeboots and duster, and the one we're currently discussing with the fatigue pants and ankle boots. It does bring up the question if this standard is too complex and it should be split up into three? The iconic aspects of a costume usually are what is worn on the torso. The Yavin Operations officer is a different standard than the Signals Tech even though the only difference is a jacket. If you peek back at the beginning of the conversations, you'll see the reasoning. The version with the riding boots and oval buckle is already covered by the ANH style standards. One of the few Rogue One costumes that was close enough to ANH to keep the existing standard! I have been working on this costume off and on since last year so I have an interest in the standard. Sorry for the confusion, carry on. It was a good question! Also, yay! I can't wait to see your costume. Moar commanders! I think giving options for the yoke color in the General Jan Dodonna and the Rebel Officers (Battle of Yavin) CS is a great idea. It would be the easiest solution since the only differences between Rogue One and ANH version are the color of the yoke, the rank badge and in some cases the color of the shirt. I would like to know what we need to complete this CS proposal. Hi Patricia! Sorry- weekends I'm not on the computer due to real world school commitments. I've started transferring this to the correct format, and should have it ready to post tomorrow. No problem, our real life is always our first the priority. I can relate, my internship at a school kept me very busy through September. Now I am back at university. I am still busy, but I am more flexible timewise. Is there anything I can do to help with the finalization of the CS? There is! I actually came specifically to post and ask you for some help. The new standard format requires that we include images for each element, and that we source where they came from. Would you be able to get me a list of where the ones you've included on the thread came from? We have some that I know are from cropped from the screenshot site, and some that are from the VG. Did you use any other sources? Like there are a couple from behind the scenes footage, correct? I also used some photos of Baze Malbus' boots that I found online but I do not remember if I found them here on the forum or if I googled them. I should be able to make a list with all the reference photos that I used, which includes information about the exact source such as the file names of the screencaps, pages of the book, the titles of the video clips, time in the video clip as well as the links to the clips. Should I post the list here or should I create a word document and post it in my Dropbox or my Google-account and then send you the link as a pm? Is there a specific format that I should use? I know you weren't asking me, but IMO, the more info available here in the forums, the better. Here is the reference source list. I think I have all my reference photos an the list. Let me know if you see one in this thread that is not on the list. I had to correct and upload the list again because one link was missing and I wrote scene instead of screencaps quite a few times. I uploaded it as a word file this time because some of the links did not work in the PDF file.